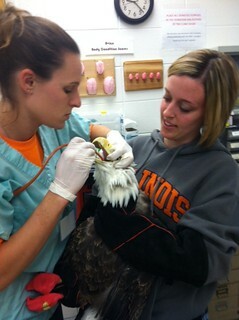 Our mission is threefold: provide care and treatment to sick, injured and orphaned wild animals, offer hands-on training to veterinary students, and educate members of our community about coexisting with native Illinois wildlife. Twenty-four hours per day, seven days per week, the Wildlife Medical Clinic (WMC) accepts ill, injured, or orphaned native wild animals, with the exception of skunks and bats. 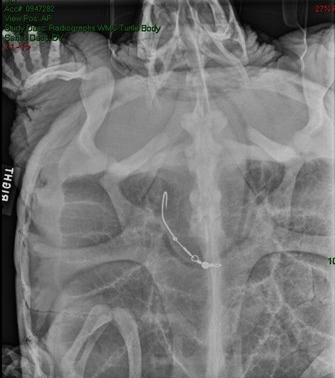 The primary goal in the treatment of these patients is to assist in their recovery for release back into the wild. Wild animals must be in peak condition for release in order to find food, avoid predation, and successfully interact with other members of their species. Unfortunately, many of the animals the clinic receives are too debilitated to recover and be released. A defect in vision, flight ability or species recognition can easily lead to the animal’s demise or exclusion from its society. For these animals who cannot be returned to their wild home, the WMC offers humane euthanasia. In special circumstances, the WMC will place permanently debilitated patients in collections at zoos, nature centers, or wildlife facilities where they will be used as ambassadors for their species in education campaigns. Presently, the WMC has five non-releasable resident raptors, as well as two non-native reptiles, who serve in our public relations program for community outreach. space and utilities, but all other costs are the responsibility of the WMC. All donations are used to pay for food, diagnostic tests, equipment, medications, consultations, and surgeries for our patients. Animal care is provided by volunteers comprised primarily of veterinary students in their first three years of the curriculum. The WMC has approximately ninety volunteers who are responsible for receiving and examining patients, as well as providing daily care to current ones. If you would like to support the WMC’s mission of conservation, public education, and veterinary teaching, then please make a donation to the WMC! Donations can now be made online! Check out our list of ways how you can help!